1. Tear a stick of string cheese into three long and two short pieces as shown. Place in your container and alternate with grape tomatoes. In a small square container put yogurt and mix with blue natural food coloring. 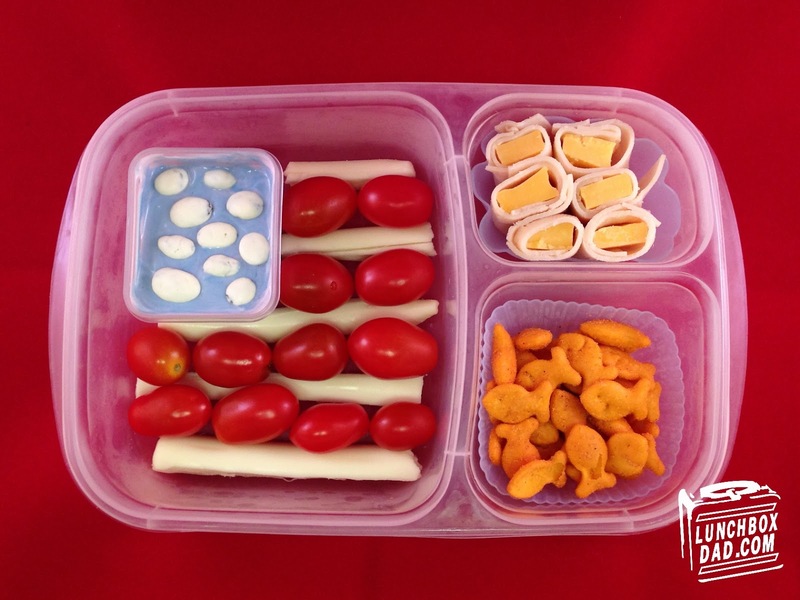 Place in the upper left hand corner of the container to make the flag. Drop in a few yogurt covered raisins. 2. In a side dish, place Goldfish crackers. I used "Smokin' BBQ" flavor to go with the theme of Memorial Day BBQs. 3. Roll each stick of cheddar cheese in a small slice of lunch meat and arrange as shown in another side dish. This doesn't have much to do with Memorial Day other than meat and cheese is on most appetizer tables or BBQs at this holiday's parties. I hope you had a great holiday weekend, remember to follow me on Facebook, Twitter, and YouTube for great updates, fun ideas, and helpful tutorials! Thanks Jenn, my daughter didnt end up eating the yogurt because she thought it was "blue goo." Oh well, it reinforces that I need to tell her everything thats in the lunch beforehand! I love the Raisin stars. I apparently packed the wrong kind of cream cheese in my daughters but she did eat the blue yoghurt you never know with kids! You just gotta try stuff till it works. For my kids sometimes it changes by the day! 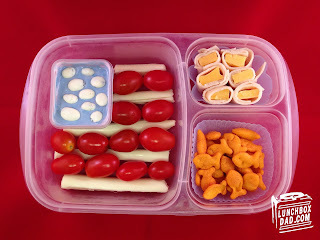 I love the "stars" in the yogurt :) Thanks so much for linking up to the 4th of July Linky Party & Happy Independence Day! Thanks and thanks for setting up the linky party!